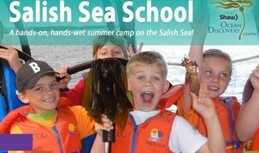 Salish Sea School is a week-long day camp for kids in Grade 1 to 5. The camp combines educational experiences in the Centre with “in the field’ activities on the beach, eco-cruises, and other adventures. Camp days are filled with games, art, and fun! One of the best vacation homes on Vancouver Island, the perfect place for your next event or holiday. An elegant Frank Lloyd Wright style home on the shore of Saanich Inlet. Enjoy a boat charter for wildlife viewing, or to travel to The Butchart Gardens. Join us for a unique opportunity to take a romantic evening cruise through the calm waters of the Saanich Inlet, followed by a contemporary West Coast inspired three course meal specially prepared by the Executive Chef. Offered on some midweek days in June, July and August.